Some vascular angiosperm plants, which are sometimes addressed as “resurrection plants,” can survive severe drought periods and regain full physiological function in the subsequent rainy season. These desiccation-tolerant (DT) plants are poikilohydric and capable of surviving the loss of at least 80–95% of their cell water content for shorter or longer periods. DT plants are important constituents of many ecosystems from the arctic (lichen and moss vegetations) to the tropics (lichen, moss, and mainly vascular/flower vegetations). The inselbergs in the tropics, as habitats ecologically isolated from their surrounding areas, are evolutionary centers of the flowering DT plants and vegetations. DT plants may be subdivided into homoiochlorophyllous (HDT) plants and poikilochlorophyllous (PDT) plants, which are using contrasting strategies to solve the same ecological problem of longer severe dryness. The HDT plants keep their chlorophyll and thylakoids during desiccation, whereas the PDT strategy is bound to desiccoplasts, a unique type of chloroplast, that break down and reconstitute their chlorophylls and thylakoids. The HDT pteridophytes and angiosperms are generally adapted to more rapid alternations of wet and dry periods than the PDT species. The PDT strategy, in turn, has evolved in habitats where the plants remain in the desiccated state for 6–10 months. Under these conditions, it is evidently more advantageous to dismantle the whole photosynthetic apparatus and to reconstitute it after rehydration. This chapter summarizes the recent developments in our understanding of physiology and ecophysiology of HDT and PDT plants and vegetations. The first author of this contribution died on July 4, 2009, at the age of only 58 years after having finished his part, i.e., the major part, of this manuscript. With great strength and a strong will he managed, despite his progressing illness, to write a very competent review. 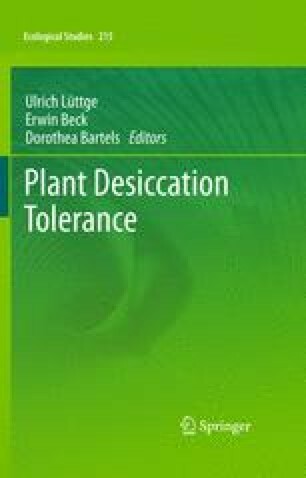 The authors are indebted to Dr. Michael C. F. Proctor for valuable discussions on the plants’ desiccation-tolerance strategies during the last 2 decades. We are also grateful to Dr. Zoltán Szabó for preparation of the reference list, to Szilvia Hajdu for her technical help, and to Ms. Gabrielle Johnson for English language assistance. H.K. Lichtenthaler wants to thank his friend and scientific colleague, the late Zoltán Tuba, for 25 years of excellent, very stimulating discussions, and close scientific cooperation in the ecophysiology of plants and their photosynthetic apparatus.